Internal Grinding Wheels can be had in Electroplated, Resin, Metal Bonds as per customer's specifications. 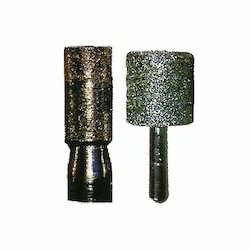 Electroplated Diamond / CBN Mounted Points are used in Bore polishing of collet holding systems. CBN Mounted points are recommended for grinding materials of more than 45 HRC. Different coating lengths will be provided as per customer's requirement. We are offering Internal Grinding Wheels to our client.